You’ve been planning this bourbon adventure for over seven months and the day has finally arrived. When the local TV weather gurus cheerfully share the picturesque forecast for the day, they seem to be talking directly to you. The cooler is packed and you’ve picked the right attire for a full day in Bourbon Country. You have maps, snacks, and blank Kentucky Bourbon Trail passports ready for their first stamp. All your bases are covered. But do you have the perfect fall Bourbon Trail music playlist? Do not make the rookie mistake of forgetting the tunes! On an average day visit to Kentucky distilleries (or horse farms, for that matter) your ride might cover over 225 miles of Kentucky highways, byways and backroads all during the course of an 11 hour stretch. In order to avoid those sleepy lulls between stops, you’ll need great music. Just like bourbon needs ice and Honest Abe needed Mary Todd, any good road trip needs a quality playlist! But you must come prepared. Trust us, playing DJ on the fly is the most thankless and unappreciated gig in the tour business. Many Mint Julep Tours guides and drivers have heard the unrelenting chorus of boos when a wayward song flops with the audience on the bus. Allow us to make things a little bit easier for you with the 10 best songs for your Bourbon Trail road trip. Taking a bit from every beloved Kentucky genre, there should be a little something for everyone in this epic set of songs. A strong candidate for a modern day successor to our beloved state song “My Old Kentucky Home.” Sorry, ole Stephen Foster. This tune showcases everything there is to love about our state in 3 minutes and 12 seconds. Mickey Clark and his crew provide a little fiddle and a little get up and go while helping you out with the correct pronunciation of a few local towns you’ll be visiting like Versailles and Paris. The perfect track to have on tap as you shift into drive and start motoring down I-65 South or I-64 East to your first stop. This song might have been written for the sole purpose of getting people excited to sample bourbon. S.O.B. comes complete with a chorus that will make you double check the odometer. Just remember, it is considered bad form to pull into the Jim Beam Distillery at 80 miles per hours. A recent cut from the modern master of twang, Steve Earle’s lonesome song about a solo, late night drive will help those miles go by a little faster. Perfect for soaking up the scenery as you stare out your bourbon bus window. No bourbon trail playlist is complete without at least a little bit of over-the-top music coming straight from 1984. 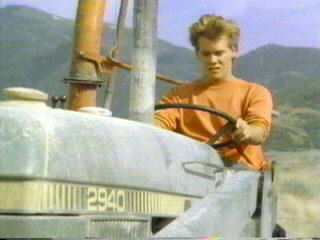 If so inspired, feel free to re-enact the scene in which an angry Kevin Bacon plays a high-stakes game of chicken with tractors in the movie Footloose. We guarantee everyone will be shouting along at top volume by the end of the song. Raise a glass to toast the ladies of the Bluegrass! Sure, the 75-year old Diamond is about as Kentucky as the Statue of Liberty, but the man sure does sing a heartfelt ballad about the girls that shine with their own kind of light. Besides, how many states can you name that have number one singles written about their beloved belles? That’s what we thought. (If you need to pinch hit with a more rockin’ version, we also recommend the Deep Purple rendition of this song). Eastbound and Down sits high on the list of greatest country road trip songs ever written. Read’s banjo is as relentless as his harmonies. Conveniently, the title provides loose directions for those who have gotten lost on the way to Maker’s Mark from Louisville. As a bonus, this song served as the theme from “Smokey and The Bandit”, so you and your crew can take turns pretending to be Burt Reynolds, Sally Field and Jackie Gleason. You didn’t think there would be an entire list of music designed for driving through the Bluegrass without a full-fledged Bluegrass song, did you? This North Carolina-based band takes this cover of The Boss’ legendary song to a whole new level. The tune invokes images of every knob and holler in the region. This one is perfect for those pensive, reflective moments when you’re trying to decide on your favorite bourbon sample of the day. Since we can’t seem to go an hour in any bar recently without hearing this great tune, we’ll bet a bucket of burgoo that at least one person on your bus knows every word to this song. And enthusiastically volunteers to sing it. Loudly. Enjoy this one while trekking down the winding road through Marion County as you seek out Bathtub Marys along the road side. The perfect song for the day’s end. Like any great country song, Berry covers love, loss and whiskey. As a bonus, this song name checks a number of bourbon brands ranging from Heaven Hill to Old Forrester to Wild Turkey. In other words, after a day in Bourbon Country, it may be the most relatable song out there! Did we miss a song? Let us know what’s on your Bourbon Trail Playlist on Twitter or Facebook. Allow us to plan your next Bourbon Adventure tour! Mint Julep Tours is the only dedicated tour company focused on The Kentucky Bourbon Trail®. Based in Louisville, Kentucky we offer Custom and Public Bourbon Distillery Tours as well as unique Exclusive Experiences, Horse Farm Tours, Culinary Tours, and Louisville City Tours. As a truly one-of-a-kind tour and destination management company, Mint Julep Tours also offers transportation and event planning services with a focus on Special Events, Corporate Outings and Bachelor/Bachelorette Parties. Specialty horse and bourbon-related gifts are available at the Mint Julep Tours retail store inside the Galt House on the third floor of the Rivue Tower at 140 North 4th Street Suite 326, Louisville, KY 40202. 502-583-1433 Ext. 106.